David Stringer-Lamarre, Managing Director of FortisCL, within his role as Chairman of the Institute of Directors, London Region, was pleased to host this event looking at Dubai. The evening was sponsored by the Dubai Multi Commodities Centre (DMCC). David spoke about the Institute of Directors, international trade and the opportunities for UK companies to successfully operate in overseas markets. A welcome address was delivered by Ahmed Bin Sulayem, Executive Chairman, DMCC. Marwan Ahmed Al Naqbi, Second Secretary, Embassy of the United Arab Emirates provided a useful insight into economic, cultural and political ties with the UK. Oliver Cornock, Editor in Chief, Oxford Business Group provided an excellent economic update on Dubai and the UAE. James Bernard, Head of Sales, DMCC delivered a detailed presentation about how the DMCC Freezone operates and its constituent companies. Alexandra Renison, Head of Trade Policy, Institute of Directors, lead a fascinating panel discussion. The panel members were: Sanjeev Dutta, Executive Director, DMCC; Eliot King, CEO, Mint Twist and Ben Danise, CEO Omobono. 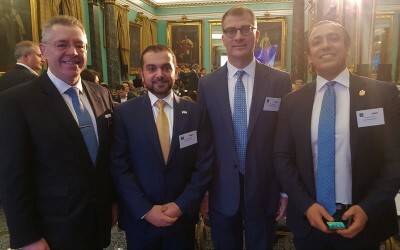 Image, left to right: Youssef Hassane, Chief Economic Adviser, Embassy of the UAE, Oliver Cornock Oxford Business Group, Marwan Ahmed Al-Naqbi Head of Economic Affairs, Embassy of the UAE and David Stringer-Lamarre.